Of all the superpowers that motherhood brings, being able to provide the best nutrition to your baby through breastmilk is definitely number one on the list. Mee Mee's Expert Manual Breast Pump comes with a unique 'one-way-airflow' system that makes it an obvious choice for you. The soft textured silicone shield helps in stimulating the breast and prevents air from entering the can which could contaminate the milk. The 'Squeeze & Hold' function helps you to control the pumping rhythm and makes the process easy and natural. It is also clinically proven to give you maximum milk flow through its massaging action. Recommended by IMAPH and certified by BIS (Bureau of Indian Standards) and ISI, this pump is sure to make your journey into motherhood easier. One way airflow: The soft textured silicone shield draws air away from the breast while expressing and keeping your breast stimulated for easy extraction. 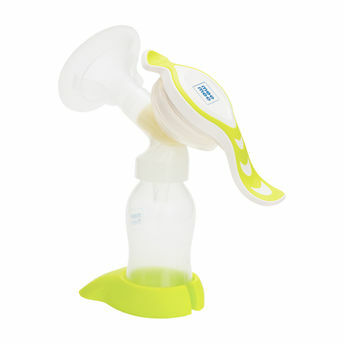 Squeeze and hold function: The pump builds up vacuum gradually as per your comfort level while milk is being expressed, for a relaxed session. All the safety, none of the BPA: All parts are made of BPA free, soft silicone and polypropylene plastic which are non-toxic in every way. We test and we test and we test: Mee Mee ensures that all their parts and materials go through strict clinical tests to be safe, durable and hygienic. No messy business: Prevents milk to flow back in to the pump set which keeps milk collection easy and clean. Celebrate your uniqueness: You can adjust the suction to a level you are most comfortable with during pumping.